Within the hushed, wood-panelled interior of the venerable 148-year-old Tanglin Club in Stevens Road, you can find another quiet, upright institution - Mr Seng Lee Fong, who tends the bar of the Churchill Room fine dining restaurant. Still going strong at the age of 86, the gentlemanly bartender, affectionately known as Uncle Seng, has worked at the club for about 52 years. Club members entering the bar greet this familiar face with a warm smile or a pat on his shoulder. Beverage manager Salim Amat, 53, says: "He's an icon. Members who have been absent for some time come back and they like to see Uncle Seng." Mr Seng was born in Malaysia and first worked as a rubber tapper in a town near Malacca. At 23, he came to Singapore and started work at a bar called Singapore Bar in Bras Basah Road, where he learnt his skills from other bartenders. He worked there for about 10 years before a friend asked him to join the Tanglin Club around 1961, when he was about 33. Back then, he earned $175 a month. These days, he is on a part-time contract and earns about $1,400 a month. He works four to six days a week - depending on the needs of the club - from 11am to 3pm, and then from 7 to 11pm. He travels to and from his home in Toa Payoh by bus. "I'm not tired, I'm very used to it already," he says in Mandarin. His responsibilities at the club include making and serving drinks, stocktaking at the end of the work day and putting in orders for what is needed. He says his manager and colleagues never let him carry heavy items and members at the club are often very understanding too. "They will tell me to take my time, or they will collect the drinks from the bar themselves so I don't have to walk over," says Mr Seng, who has no health problems apart from suffering from high blood pressure. Though he admits that he cannot remember all the names of the members, he does recognise their faces and because he has been there for so many years, he knows what the regulars like to drink. 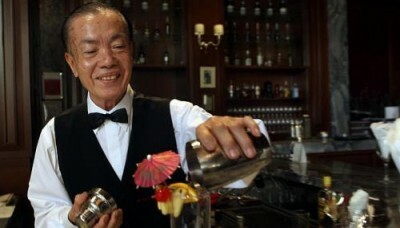 Mr Salim says that when he first joined the Tanglin Club in the 1980s, Mr Seng was the head bartender and taught him all about liquor, cocktails and which glasses to use. He recalls a good tip that Mr Seng shared with him then: "He said ladies like to maintain their figure, so be sure to control the sweetness of their drinks." Mr Seng, a father of five children, all in their 40s and 50s, says the people at the club are like his family, so he finds it hard to leave his job. His colleagues even celebrate his birthday each year and buy him a cake. Keen to keep on working, he adds: "I don't want to retire. There is nothing to do at home, I'll be bored, so I might as well keep working. It's like my exercise." If a postal package is damaged or a stamp looks fraudulent and an investigation needs to be carried out, Mr Wong Kee Fah is the man for the job. The 71-year-old is a postal security officer at Singapore Post and handles mail-related crimes. He is one of the oldest employees under the rehire scheme at SingPost. "I have a passion to investigate and sniff out how something happened, why it happened and when," says Mr Wong, who started working at the registered mail unit of SingPost in 1962. He then moved to the counter services division in 1965 and worked there for 10 years before he was asked to join the postal security department in 1975. He has remained there since. He says stints in various units and departments have given him a leg-up in his investigative work. "You must have operations knowledge. If your operations knowledge is poor, how are you going to interview people to find out if people are doing their job," says the father of two sons aged 40 and 38. His wife is a retired clerical officer. Although he has no powers of arrest, he has spotted and investigated crimes which have led to arrests. For example, in 1991, he caught an assistant postman slipping letters into his shoe. The postman said in a subsequent news report that he had stolen the letters in the hope of finding some cash. He was fined $500. In 1998, Mr Wong helped track down a postman who stole nearly $2,500 worth of old New Zealand currency notes, which he took from a registered letter. The postman was jailed four months. As part of his training, Mr Wong has travelled to Australia and the United Kingdom, where he attended a month-long Information Collection Analysis course, conducted by retired investigators from Scotland Yard. And he continues to learn and improve his skills, says Mr Paul Tan, 37, assistant vice-president of the security and investigation department at SingPost: "The business has been changing and this is the e-commerce era, but Mr Wong is still open to finding out more about the new processes." Having worked in the same company for so many years has its advantages as Mr Wong has gained a reputation as a trusted and discreet colleague and often receives tip-offs from fellow colleagues who are suspicious about packages or co-workers. "When this has been your playground for 50 years, you know quite a lot of people and they will tell you things. They must trust you," he says. But he is also aware that one day, he will not have the mental or physical ability to carry out his job, which requires him to clock 44 hours a week and conduct spot checks at night. He generally works from 10am to 7pm each day, and though he would not give his exact salary, he says he earns in the range of $2,500 to $3,500 a month. He says he will leave his job when he cannot "meet the demands physically and mentally". He adds: "I will assess my ability to carry out my job and quit when it's time. I don't want to wait for people to ask me to leave." Unlike many drivers, when Mr Thambiah Ramasamy passes through an ERP gantry, he does not wince as the beep sounds with a charge. Instead, he feels a sense of pride. "I helped to put up the first gantry and till now, I'm still doing it," says the 76-year-old, who is the principal engineering assistant in the Land Transport Authority's (LTA) road-pricing systems division. He also had a hand in building the National Stadium carpark and carried out soil tests for major roads such as the Pan-Island Expressway and the East Coast Parkway. Last year, he received a 60-year long-service award for his work in the civil service - first at the former City Council, then at the Public Works Department and later at the LTA. His current responsibilities include supervising and coordinating all civil engineering works for the erection of Electronic Road Pricing gantries and routine site inspections to look for defects. When checking the soil before erecting a gantry, he says he can predict the density and moisture content of the soil by just touching it. He also oversees the concrete casting, which forms the base of the gantry. Sometimes, he says, that can take seven to eight hours and he will spend the whole time standing to supervise the work. This worries his wife, a housewife, who has often asked him to retire and rest at home. But Mr Thambiah, who is diabetic, is not about to quit. He works five days a week from 7.30am to 5pm and earns about $2,900 a month. "I feel that since I know the bosses and they are all very good to me, I will continue." The father of four adds: "Maybe three more years." His former supervisor, Mr Tan Hiok Seng, 56, says that despite his age, the elderly gentleman "puts many of us to shame". He adds: "As far as I know, he has hardly taken a day of medical leave." He also says that Mr Thambiah is "exceptionally reliable and responsible" and will always get a job done well. "Even though younger officers are more highly educated, they respect Mr Thambiah's depth of knowledge." Mr Thambiah holds an O-level certificate. Despite all his contributions, he is humble and just happy to do his job well. "No gantry has sunk, it has never happened. That is a good accomplishment," he says. A mural at Yishun Secondary School depicts scenes of old and modern Singapore. Trams contrast with today's MRT. A line of people queue for water rations, against people drinking Newater. Art teacher Alan Wong Hiong Boon painted it in 2008 with the help of students. He says he did it to tell students that everything is now "made for them", unlike in Singapore's early years, and they should not "just enjoy the opportunities but use the opportunities to do more for themselves". He ought to know. The adjunct teacher, who painted two other murals in the school, is still going strong at 81. He teaches students of all levels in Yishun Secondary. He is in school from 7.30am to 2.30pm every day and would say only that he is paid by the hour. The active octogenarian hopes he can help young Singaporeans "appreciate art as a way of life". He says: "Out of 40 students, one or two may become artists, the rest will know the value of good art. Maybe they can become collectors and so the professional artists can earn a better living." His teaching career began in 1951, when Singapore was still under British colonial rule. He went to the Teachers' Training College after his O levels. He first taught all subjects at primary school level, then history, geography, English and art at what is now Serangoon Secondary School. In the 1960s, he worked at the National Youth Leadership Institute, which trained youth leaders, and in the late 1960s, after the nation's independence, became a training officer in the civil defence force where he devised training programmes. He rose in the ranks and in 1983, retired as the force's deputy commandant. But he never truly retired. He worked as art director at an events company for a few years. By the late 1980s, he returned to schools as a relief teacher. The spontaneous and sporting Mr Wong also landed cameo acting roles in student films and TV shows such as Triple Nine, Growing Up and Incredible Tales. Always challenging himself, he signed up for the Mr Senior Singapore 2010 competition organised by the People's Association's Active Ageing Council, which searches for active agers, and came in third. On his varied interests and pursuits, he says: "My philosophy is do what you are supposed to do and then a bit more." Mr Wong, who walks with a spring in his step and climbs stairs with ease, says he also uses art "as a means to promote national education". Recently, the World War II survivor was invited to share his sketches of the Japanese Occupation with recruits of the Guards unit at the army's Bedok camp. He was 10 years old when Singapore fell. Says Ms Ng Ngoing Keng, 54, principal of Yishun Secondary: "When he talks about the Japanese Occupation, it is real and authentic and students understand it better. With his artistic skill, he can also make his experiences visible." She adds: "Mr Wong is not only a role model to students but also to teachers. He is full of passion in transferring his knowledge." Mr Wong, who is married to a retired jewellery designer and has two sons in their 30s, says he will teach and challenge himself for as long as he can. "I'm like a coin still in circulation, still trying to hold value." Nurse manager Cheong Yoke Ling, 72, says this "may be her final year" in the nursing profession. But she admits she has said this before and each year, when it is time to renew her contract, she decides to stay on. "Tan Tock Seng Hospital is my second home. If I leave, I will feel sad, we are like family," says Madam Cheong, who has been working at the hospital since 1960, after completing her O levels. At the time, she trained at the hospital for three months and then learnt on the job from senior nurses. "This is my first job and I applied for it because I wanted to have contact with people," says the mother of four sons aged 35 to 43. Her husband is an accountant who retired more than 10 years ago and encourages her to do the same. "He watches TV and reads books but I want to work and move around," she says. She is on a post-retirement contract and works four nights a week, from 9pm to 8am. There are at least three nurses at Tan Tock Seng Hospital who are aged 70 and above. As a nurse manager, Madam Cheong says she plays a supervisory role, which includes making sure procedures are followed and intervening when there are emergencies or difficult family members to handle. In particular, she says family members can get aggressive when their loved ones have to wait for treatment. Often, they will scold the nursing staff and younger, less experienced nurses have broken down because of the abuse. "But I tell the nurses to try to remove themselves from the situation. We have to put our emotions aside, if not, we can't do our work," says Madam Cheong, who knows exactly how the younger nurses feel as she had similar experiences in her youth. Ms Karen Chng, 39, a urology and continence nurse clinician at Tan Tock Seng Hospital, says she still remembers how Madam Cheong personally introduced her to all the nurses in the ward on her first day of work. Says Ms Chng: "She also taught me to see patients in a holistic way. For example, during meal time, don't just serve them food and go, but talk to them and encourage them." Although Madam Cheong is getting on in her years and her "movements are slower", she feels she can still contribute because she is "mentally alert". She also admits that she is no expert in using technology, but she is not daunted and gets the younger nurses to teach her how to use computer systems. "I will give them what I know but they can also teach me," she says.